Note: The OpenAttestation project will no longer receive any updates. Please use Open CIT, the next generation attestation solution. This project provides an SDK to create cloud management tools. These tools are capable of establishing the hosts’ integrity information by remotely retrieving and verifying integrity with Trusted Platform Module (TPM) quotes. OpenStack and oVirt both use OpenAttestation. The Asset Tag Management service leverages Intel TXT-enabled processors to securely write Administrator-defined descriptors to the hardware. 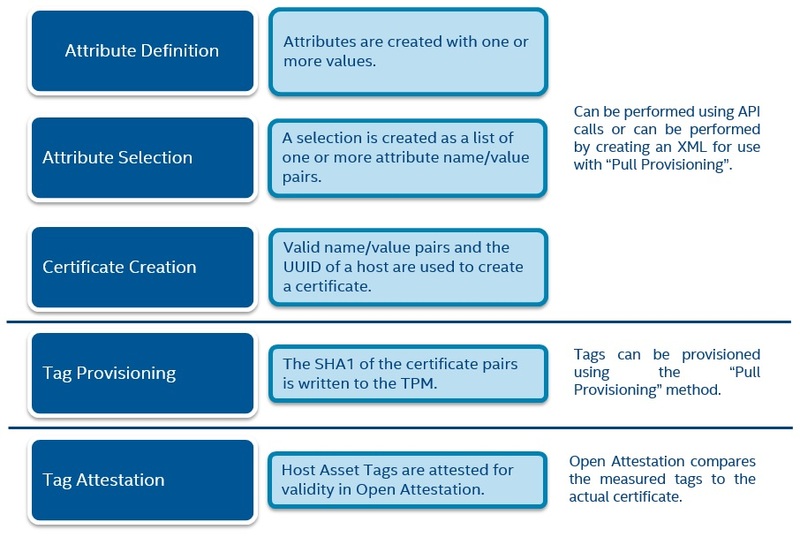 These values can be made visible in the datacenter by using the Open Attestation project, and can then be used to provide workload verification, remediation, reporting, and compliance in both public and private cloud environments. This toolkit is available for cloud distributing OEMs, operating system vendors, and system builders. OpenAttestation is used by OpenStack, oVirt, Fedora, Ubuntu, and Red Hat Enterprise Linux. This project is distributed under the BSD license. These open source optimizations are used in servers featuring Intel® Atom™ processors, Intel® Xeon® processors, and Intel® Xeon Phi™ coprocessors. OpenAttestation v2.2 was released December 31, 2014. Refer to https://01.org/openattestation/downloads/v2.2-source-code for release notes and downloading url. OpenAttestation v1.7 was released March 31, 2014. Refer to https://01.org/openattestation/downloads/2014/v1.7-source-code for release notes and downloading url.